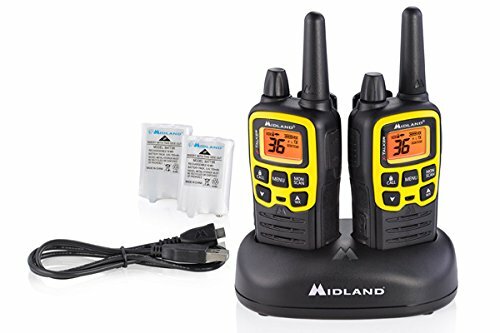 Gear up for the outdoors without sacrificing communication with the Midland T61VP3 X-TALKER Walkie Talkie. It is a water resistant radio that provides clear point-to-point communication, reception, transmission, and sound quality. Connection to other FRS/GMRS two way radios is limitless as long as you connect to the same channels/frequencies. The T61VP3 features 121 Privacy Codes, 9 levels of eVOX - Hands-Free Operation, a 32 mile communication range, and 36 scannable channels (14 extra channels) with easy button access. Unlike other FRS walkie talkies on the market that use lithium batteries, the T61VP3 X-TALKER has dual power options - use 700mAh rechargeable batteries (x2) or 3 “AAA” Alkaline batteries each (not included). The rechargeable battery packs take 3-4 hours to charge. The Weather Scan feature finds the nearest NOAA broadcast to stay up to date with the latest weather and hazard information and the NOAA Weather Alert feature sounds an alarm indicating when severe weather could be present in your area. The T61VP3 X-TALKER provides an easy-to-use, license-free, and low cost yet reliable solution to long-range communication for any outdoor enthusiast. 36 CHANNELS - These license-free walkie-talkies feature 36 FRS/GMRS (Family Radio Service) channels, along with channel scan to check for activity. 32-MILE RANGE - Longer range communication in open areas with little or no obstruction. 121 CTCSS PRIVACY CODES - The Continuous Tone-Coded Squelch System gives you up to 2,662 channel options to help block other conversations. Use silent operation to turn off all tones. HANDS-FREE - Easy Voice and Sound Activation Transmission (eVOX) with 9 sensitivity levels for hands-free operation. Also included: Belt clips (x2), 700mAh rechargeable battery packs (x2), desktop charger, micro USB charging cable and an owner's manual. If you have any questions about this product by Midland, contact us by completing and submitting the form below. If you are looking for a specif part number, please include it with your message.